I have had Installment one for a couple of weeks now. 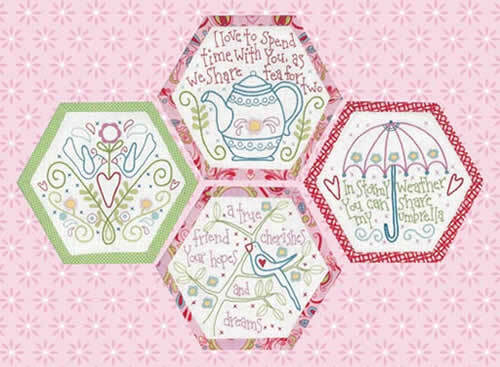 I have been playing with a couple of ideas, even drafting Paper Piecing templates for the plain hexies. First up I was going to use a new range in at my LQS and then planned on using all my Bonnie and Camille Scraps. Something was stopping me. It just wasn't right so I just let the pattern sit there. Then on Wednesday I could hear a "scream". 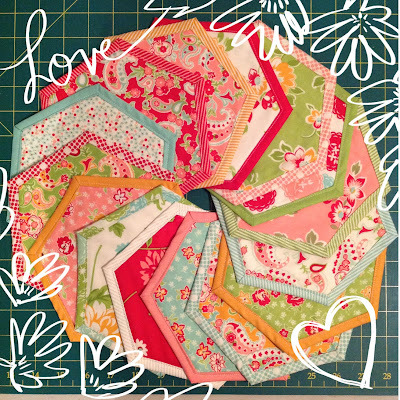 This pattern is "quilt as you go" and I need 60+ of the plain hexies plus the embroidered ones. I have started on the plain ones. Here are the first 15. Now to pick some coordinating threads. Another lovely project....I can't keep up with all you do. 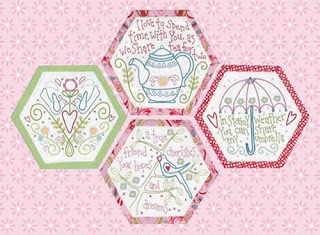 Your fabric choice is great and the framed hexies look to be perfect to frame the stitcheries. This is going to look scrumptious. Those hexie stitcheries sure are nice. I love your fabric. This is scrumptious! 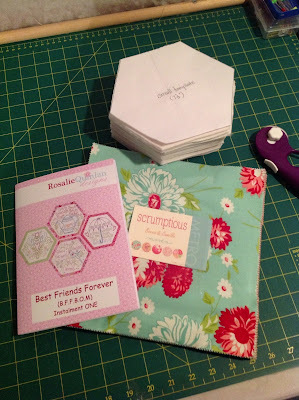 Your hexies are great! another gorgeous project that your are going to make even more so. I'm going to audition fabrics for mine this weekend and if I can't find anything that screams at me I think I'll be heading sown the scrumptious path too as it really looks scrummy! I agree your fabric choice is gorgeous! Its a lovely BOM, enjoy the journey! oh they look so beautiful, I'm trying so hard to refrain and decided I wasn't going to purchase these.....but now you have done this!! naughty woman!! 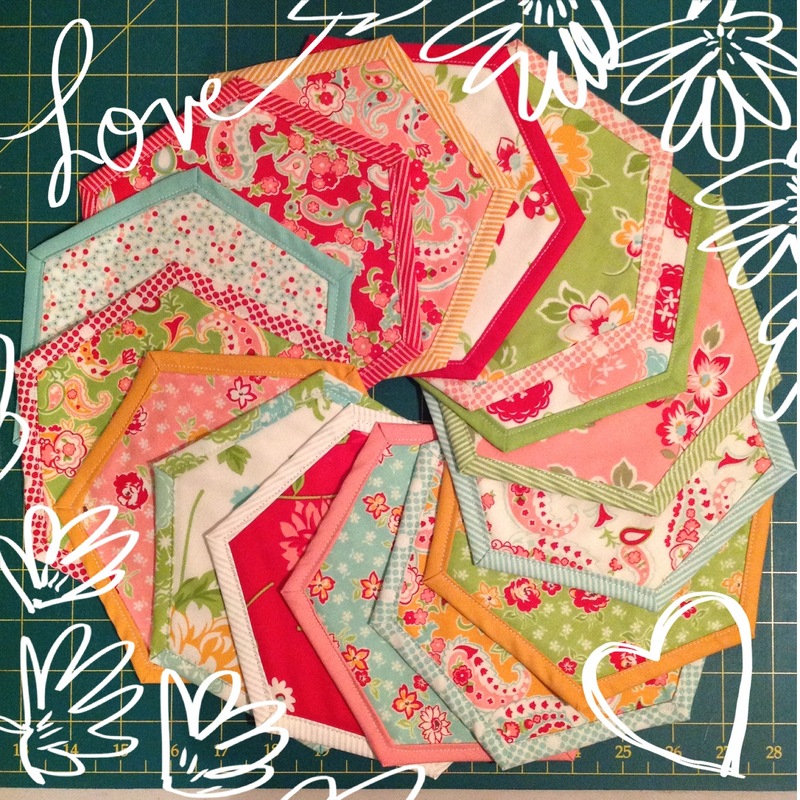 What a perfect choice of fabric for your hexies, look forward to seeing what colour threads you'll be using for the stitcheries :) Barb. 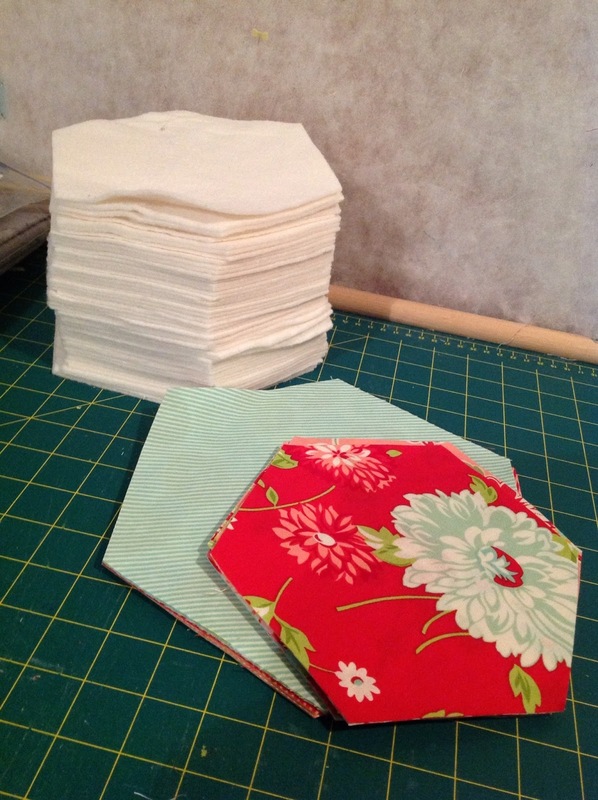 Good decision to wait until you knew which would be the perfect fabric to use - these are gorgeous! I've been having th3e same issue as you - what fabrics to use..still thinking on that.. I think picking the threads will be easy now. and I meant yo add - they really are scrumptious! These are fantastic Sharon and I think the fabric range is just made for it.